Go to Two-Step-Login (Duo). If prompted, log in with your IU username and passphrase. You will receive email notification if your login is completed successfully. If you've lost or misplaced your device, contact your campus Support Center. Click Manage devices & settings. Use the Duo Control Panel to complete another two-step login (Step 1 in the instruction panel). To lessen the number of times you need to complete a login with Duo, select Remember me for 7 days when completing a login. This will keep you from having to Two-Step for CAS logins for seven days in the browser from which you initiated your login. If you have autopush enabled, you'll need to cancel the autopush to check the box, and then resend the push to complete the login. If your smartphone does not have a US or Canadian phone number, instead choose the instructions for enrolling a smartphone without using a phone number. You can two-step with Duo's mobile application, Duo Mobile. Although you can also two-step without the Duo Mobile app by receiving a phone call or text message (SMS) passcodes, UITS strongly recommends using the Duo Mobile application. To see how this works, watch a video about using a smartphone or tablet with Duo. In the Duo Control Panel, click Add another device. Enter your device's phone number and verify that it's correct. Click Continue. You can two-step with Duo's mobile application, Duo Mobile. To see how this works, watch a video about using a smartphone or tablet with Duo. Be sure you're using the supported browser, Chrome 41 or later. Then insert the token into your device's USB port. Enrolled U2F tokens will display under "My Settings & Devices" in the Duo Control Panel, but will not display under "You can Two-Step Login with:" on the "Your devices & settings" page. You can two-step with Duo by receiving a phone call or a text message to your Google Voice phone number. Phone calls and text messages sent to your Google Voice phone number will also be delivered to your Gmail email account. Due to security concerns, the University Information Security Office (UISO) recommends that you do not forward your Gmail email to your IU email account. For a cell phone, select Mobile phone, and click Continue. If you have a single-button hardware token, the Support Center or your IT Pro has probably already enrolled it with your Two-Step Login (Duo) account. To confirm, go to Two-Step-Login (Duo) and click the green Your devices & Settings button. If the button instead reads "Enroll a device" (rather than "Your devices & settings"), contact your campus Support Center to request activation. Under "Manage devices & settings"
You cannot remove your only device or token. If you wish to replace your only device or token, first enroll or activate its replacement, and then delete the original. In the Duo Control Panel, next to the device you wish to remove, click Device options. Click the trash icon, and click Save. In the Duo Control Panel, next to the device you wish to rename, click Device options. Select Change Device Name, and enter a new name for your device. In the Duo Control Panel, click the drop-down menu next to "Default Device:", and select the device you wish to set as your default for Duo. You cannot choose a one-button hardware token or a U2F token as your default device. In the Duo Control Panel, click the drop-down menu next to "Default Device:", and select the device you wish to use with automatic Duo Push/Call. Click the drop-down menu next to "When I log in:", and select either Automatically send this device a Duo Push or Automatically call this device. Enter the new phone number, verify that it's correct, and then click Continue. Since you should already have Duo Mobile installed, click I have Duo Mobile installed. Open the Duo Mobile app on your phone, tap Edit, and then tap the minus icon next to the "Indiana University" entry. Select Delete, and then, when prompted, confirm the deletion. Tap Done. Once the account has been removed, at the top, tap the plus icon, scan the QR code displayed on the computer monitor. Once the account is added in Duo Mobile, click Continue in the Duo Control Panel and it will refresh with the "My Settings & Devices" page. From the "My Devices" section, to the right of your old phone number, select Device Options, and then click the trash icon. When prompted, click Remove, and then click Done. In the Duo Control Panel, next to the appropriate device, click Device Options. Select Reactivate Duo Mobile, and then follow the on-screen instructions. If the device is associated with a phone number, select the appropriate platform, and then click Continue. If Duo Mobile is not installed on your device, follow the instructions in the Duo Control Panel to install the Duo Mobile app. Click I have Duo Mobile installed, and you will be presented with a QR code. Follow the instructions in the Duo Control Panel to reactivate Duo Mobile on your device. To finish reactivating Duo Mobile, click Continue. Open Duo Mobile on your device, and then tap Edit. 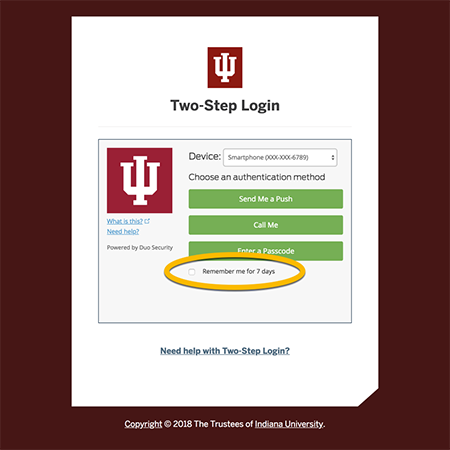 Tap - (minus sign) next to the "Indiana University" account, and select Delete. When prompted, confirm the account deletion, and then tap Done. This is document bfkp in the Knowledge Base. Last modified on 2019-03-26 14:20:12.